GILBERTSVILLE, Ky. (May 20, 2018) – Pro Jason Lambert of Michie, Tennessee, brought five bass weighing 27 pounds, 3 ounces, to the FLW weigh-in stage Sunday to win the FLW Tour at Kentucky Lake presented by Costa Sunglasses by a margin of 28 pounds even – a new all-time FLW Tour record for margin of victory. Overall, Lambert’s four-day total of 101 pounds, 9 ounces, was the most weight to ever win an FLW Tour event at Kentucky Lake, and the tenth-largest total-tournament catch in FLW Tour history. For his dominant performance on the water this week, Lambert earned $100,000. Lambert’s first stop on championship Sunday was a point protruding from the mouth of Pisgah Bay, the location where he upgraded his limit with a 9-pounder Saturday. 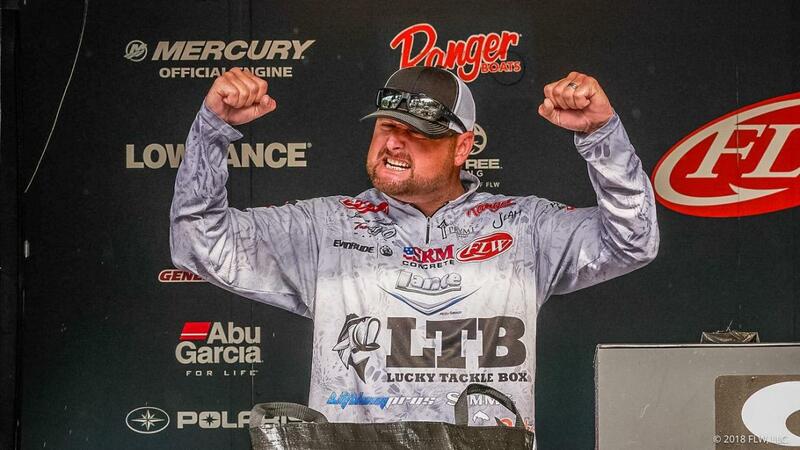 With a 19-pound advantage heading into today’s competition, Lambert knew that all he needed was a few keeper bites to shut the door. As the morning progressed, Lambert moved to an area that produced for him both on Thursday and Saturday – a south-facing point on a main-lake ridge, just north of the U.S. Highway 68 bridge. Lambert’s main lure for the week was a 5- and 7-inch Green Shad-colored Castaic Jerky J soft jerkbait on a 1-ounce Scrounger Head-type jig on 18-pound-test Sunline Super FC Sniper Fluorocarbon line with a 7-foot, 11-inch Duckett White Ice II swimbait rod and a Duckett 360RW reel. On Friday, Lambert also used a Gene Larew Tattletail Worm on a jighead to catch his limit south of Paris from a ditch on a shallow roadbed. Overall there were 48 bass weighing 180 pounds, 8 ounces, caught by all 10 pros Sunday. Eight of the final 10 pros caught a five-bass limit. The total purse for the FLW Tour at Kentucky Lake presented by Costa Sunglasses was more than $930,000. The event was hosted by the Kentucky Lake Convention & Visitors Bureau. The next tournament for FLW Tour anglers will be the FLW Tour at Lake St. Clair presented by Mercury, June 28 to July 1, in Detroit, Michigan, hosted by the Detroit Sports Commission, Macomb County, Huron-Clinton Metroparks Authority, and the Sterling Heights Regional Chamber of Commerce. In FLW Tour competition, pros and co-anglers are randomly paired each day, with pros supplying the boat, controlling boat movement and competing against other pros. Co-anglers fish from the back deck against other co-anglers. The full field of anglers competed in the two-day opening round. Co-angler competition concluded following Friday’s weigh-in, while the top 30 pros based on their two-day accumulated weight advanced to Saturday. Only the top 10 pros continued competition Sunday, with the winner determined by the heaviest accumulated weight from the four days of competition.